Recent studies have shown significant improvements in reading test scores of children who continue reading books of their choice during the summer. The study also found that, “children improved their reading scores even though they typically weren’t selecting the curriculum books or classics that teachers normally assigned for summer reading.”2 Most students favored pop-culture books featuring musicians, athletes, and television and movie characters. Additional studies have found that boys do not read as much as their female counterparts. For the past 30 years, girls have outperformed boys on reading tests in every age group, according to the U.S. Department of Education reading tests.3 However, similar to the conclusions of the University of Tennessee, Knoxville study, author and former National Ambassador for Young People’s Literature Jon Scieszka agrees that guys are more likely to read when the topic is of their interest. As a result, Scieszka created guysread.com, a web-based literacy program that offers reading suggestions that appeal to the interests of boys. Recently, he has expanded his venture to include Guys Listen, which encourages boys to embrace both the written and spoken word. Taking the contemporary interests of young readers into consideration, Midwest Tape has compiled a collection of Must-Have Youth Audiobooks, recommended by School Library Journal. To find this collection and other collections of audiobooks tailored to fit the interests of young listeners, click the browse tab on the Midwest Tape website. 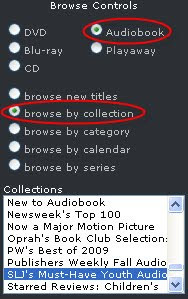 Then, select Audiobook and browse by collection in the Browse Controls. Some of our other collections featuring notable audiobooks for kids and young adults are named 2010 ALSC Notable Audiobooks, Booklist Best Audio for Kids, New & Notable Children’s/YA, and Critic’s Picks: Children’s Collection. After browsing our lists, are there any other audiobooks you would recommend for young readers?